by the architect-designer William James Neatby (1860-1910), c1905. The decorative panels are based on Neatby's own mural scheme for the Norwich Union Headquarters Building, Surrey House, in Norwich, Norfolk. (ref see Fig 22 DAS Journal 26 of 2002 page 56; article by Alastair Scott Anderson on WJ Neatby's designs, showing Neatby's own archive photo of said design). 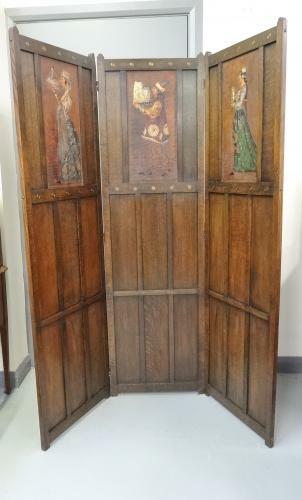 Approx 68" high and 59" wide overall; each panel approx 19.5" wide. WJ Neatby originally trained as an architect but then worked at Burmantofts for the Leeds Fireclay Co., as designer & painter. He later, in 1899, joined Doulton of Lambeth as head of the architectural decoration department, up until 1900. Then, he set up his own practice in London with E Hollyer Hayes under the trade name of Neatby, Evans & Co., designers & manufacturers of furniture, metalwork and stained glass. Amongst many other things, Neatby was famous for his lavish tile designs (still in existence) inside the Harrods Food Hall in London, and the Everad Building in Bristol. The London practice was unfortunately short lived, as Neatby died in 1910, so items from that period him are tremendously scarce.